Digital transformation is more important for government than for all industries, reports Gartner. 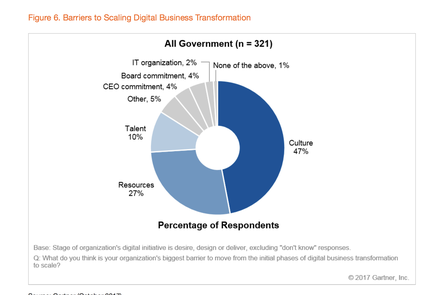 Digital transformation is the number one business priority among government CIOs overall, followed by security and governance, reports Gartner. 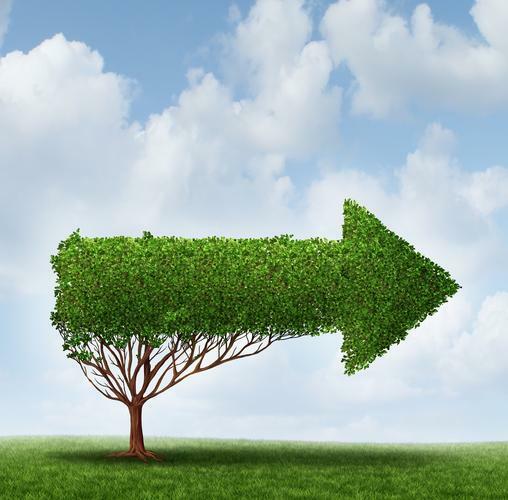 "Digital transformation revolves around data. To be successful, public sector CIOs need to focus on expanding their data and analytics capabilities and creating a data-centric culture, by increasing the availability of open data and APIs for internal use and public consumption," says Rick Howard, research vice president at Gartner. "Building out data analytics infrastructure is fundamental to improving government program outcomes and services to citizens,” says Howard, summarising insights of government CIOs in Gartner’s 2018 CIO Agenda Survey. The survey gathered data from 3,160 CIO respondents in 98 countries and across major industries, including 461 government CIOs. Government respondents were segmented into national or federal; state or province (regional); local; and defence and intelligence, to identify trends specific to each tier. 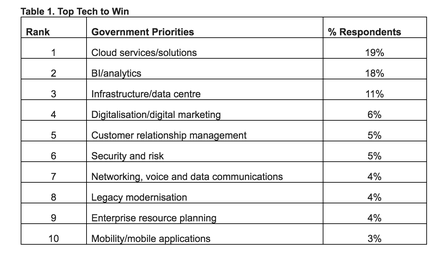 The survey found that digital business/digital transformation is more important for government (first priority for 18 per cent of respondents) than for all industries (17 per cent), with the exception of defence and intelligence agencies (six per cent). Private sector companies ranked it second, after growth/market share. The next three business priorities for government are security, safety and risk (13 per cent); governance, compliance and regulations (12 per cent); and technology initiatives/improvements (11 per cent). "Government CIOs have conflicting priorities — to bring transformative change to their organisations, while pursuing compliance-oriented priorities," says Howard. "They will need to work constructively with other business leaders to agree how to balance risk and innovation to support digital transformation." The government CIOs, meanwhile, cite culture, insufficient resources and access to talent as top barriers to scaling digital transformation. “For those organisations where culture or organisational structure is resistant to change, the talent gap is usually compounded, since cultural inertia inhibits new learning,” he adds. Thus, government CIOs should consider the organisation's culture when implementing large scale digital change, reports Howard in the 2018 CIO Agenda: Government Insights. 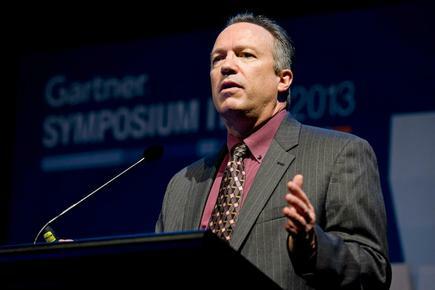 Howard says it is important for CIOs to create an effective continuous-learning capability. Otherwise, talent shortages will affect their success as they compete with all enterprises in seeking scarce digital era skill sets. He also recommends CIOs to expand their talent base by growing more versatilists, or staff with "breadth and depth" of skills that allow them to work in multiple assignments, with different constituents, and different business units. 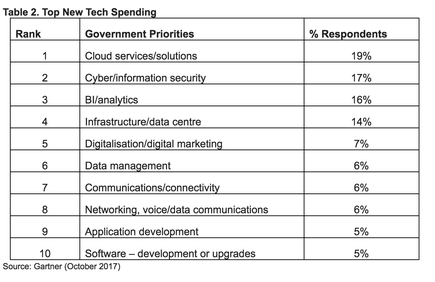 Gartner, meanwhile, says cloud solutions, cybersecurity and analytics are the top technologies of government CIOs for new and additional spending in 2018. Datacentre infrastructure is the most commonly targeted for cost savings. While only 5 per cent of government CIOs considered security and risk as crucial to achieving the organisation's mission, 17 per cent expect to boost spending in cyber/information security. This indicates that security is not a competitive differentiator for government, but additional spending over historical levels in this area is warranted as a response to relentless attempts to exploit system vulnerabilities, says Howard. "The lessons of reputational damage and individual harm that can result from a data breach or compromised security have not been lost on business leaders," he states. "Consequently, they're willing to allocate more resources and attention to lower risk exposure from cyberattacks."